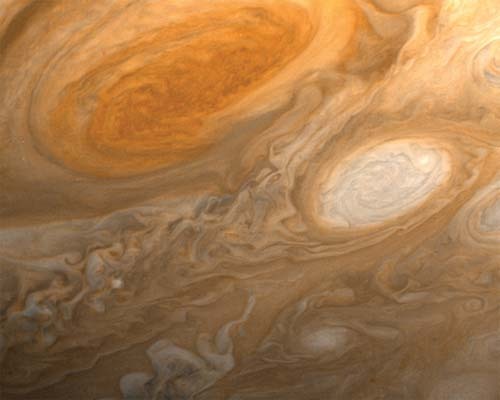 What are some other characteristics of Jupiter’s atmosphere? The mini-probe launched in 1995 from the Galileo spacecraft made detailed measurements of Jupiter’s atmosphere down to about 90 miles (150 kilometers) below the cloud-tops. It found that these upper layers of Jupiter’s deep, dense atmosphere contain water vapor, helium, hydrogen, carbon, sulfur, and neon, all in lower concentrations than were previously predicted. On the other hand, it had higher concentrations of other gases, such as krypton and xenon. Scientists were also surprised by what the probe did not find. Rather than several dense cloud layers of ammonia, hydrogen sulfide, and water vapor, as was predicted, the probe only detected thin, hazy clouds. Also, scientists had predicted tremendous amounts of lightning discharges, but only faint signs of lightning at least six hundred miles (one thousand kilometers) away were detected. This suggested that, at these atmospheric depths, lightning occurs on Jupiter only about one-tenth as often as it does on Earth. It is important to note, though, that the surprising results from Galileo’s mini-probe were only obtained from one area in Jupiter’s atmosphere. It is possible that the atmospheric conditions there were not representative of the entire atmosphere.